An outdoor sound installation by Absolute Value of Noise © 2013. Drop = Blip = Clatter is an outdoor sound installation that responds to the rain. It was made for The Rain Gatherers - an open art lab and exhibition by Second Site collective. 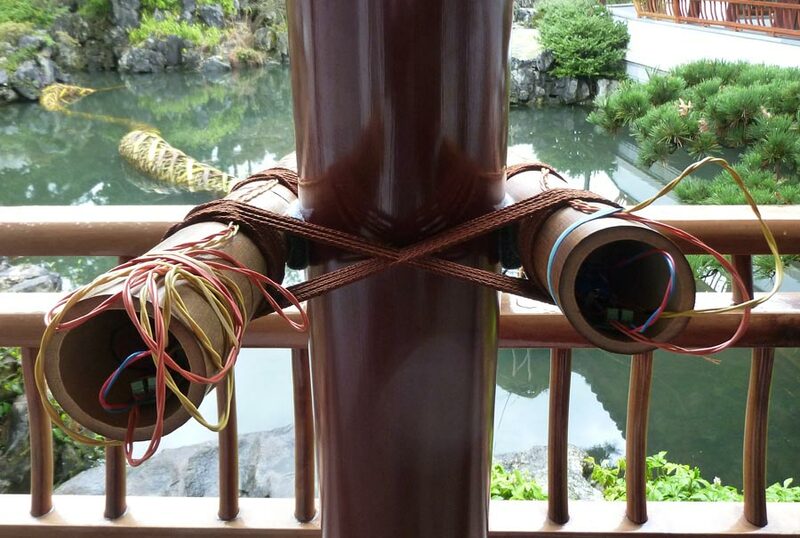 The piece was installed at the Dr. Sun Yat-Sen Classical Chinese Garden in Vancouver from March 16 - April 14, 2013. In order to break the paradigm of using massive energy systems to power civilization, we can think outside of the box and imagine ways of integrating small-scale alternative energy sources into our daily lives. What would it be like to surround ourselves with low-powered gadgets such as small lamps, transistor radios, and even laptops that were powered by local sources of energy - the power of the sun or even the power of a single rain drop. 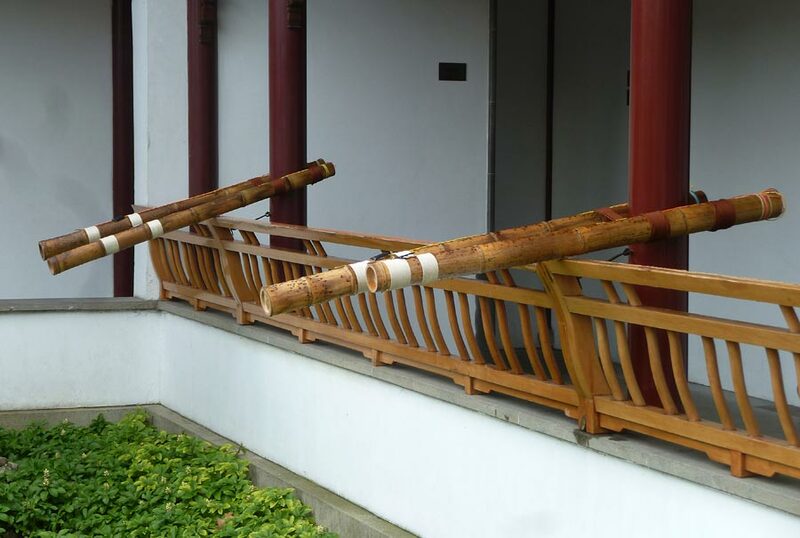 Drop = Blip = Clatter consists of four bamboo tubes, each approximately four feet long. Inside each hollow chamber is an energy harvesting device that collects energy from the sun and the rain. When enough energy has been collected by the harvester, the device will start to make noises with each rain drop that falls on its rain collector. The Dr. Sun Yat-Sen Garden is an interesting location for working with rain. The garden is surrounded by a covered walkway that allows visitors to stay dry. The roof of this walkway is made up of many "drip-tiles" that collect and funnel rain water down to the edges of the roof, where it drips and pours out through funnels into the gardens and waterways below. As a result, the rain creates an unique sense of poetry and place within the garden. 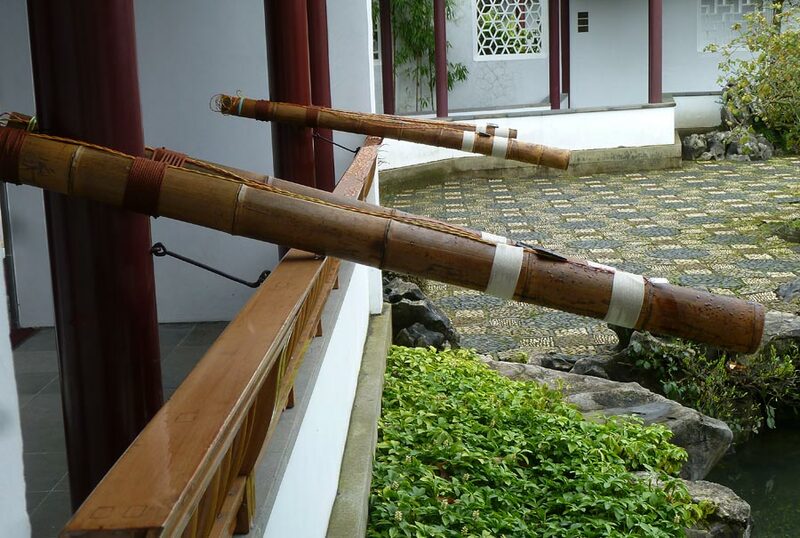 The sound of the Rain Sticks - recorded May 24, 2013.
at Dr. Sun Yat-Sen Garden, March-April 2013.